Bring warm drinks like tea or coffee in a thermos flask to warm yourself from the inside. Deflate the tires a little to get a better grip if the roads are snowy. Spray your bike lock with teflon spray to prevent it from freezing up. Take a look at the sign top right – a bicycle lane sign. Note the barb wire on the bike lane but not on the open road. They’re obviously pulling out all measures to stop the cyclists – proof that cyclist discrimination has been around for a long time. What are the Pros using this year. The route of the inaugural Mont Ventoux one-day race has been revealed. The pros will tackle the brutal and beautiful summit in a single 185km event for the first time. The Mont Ventoux Denivelé Challenge, a new UCI 1.1 category addition to the calendar, is set for June 17 and will feature a gruelling 4,400metres of climbing. Starting from Vaison-la-Romaine north of the iconic climb, the peloton will loop around the mountain via Reilhanette, Sault, and Gordes, before heading north to the town of Bédoin at the foot of the climb. The route then follows the classic ascent to the summit of Ventoux. Brett smacked out a HRS journey on this Australia Day weekend. Head over to his activity and give him a kudos. The end of another TdU, and the end of a big week. My focus for the week was the Cancer Council’s Ride for a Reason, raising money and riding. I had set myself 2 targets, the main being a $5,000 fundraising target, which at last count was over $5,100 raised by all you good people. The second was a 1,000km ride target over the 1 days of the TdU festival, which i ticked over on Saturday having ridden 1,031km (with 9004m climbing). It was good to see the turnouts for the woman’s TdU, won by Amanda Spratt from Mitchelton Scott. There were some very early starts to the day to beat the heat, and some very lazy afternoons to try and catch up on sleep and recover. Saturday before the start of the TdU I met an Englishman down at the over in Adelaide for the first time, Mark Pavelly from Mallorca Cycling Tours. Some of his Australian clients had recommended the TdU as a must do. The Monday afternoon, being a passionate South Australian, I picked Mark up and took him on a quick tour of the Adelaide Hills. Norton Summit , Cherryville, Corkscrew, Fox Creek, Woodside, Hahndorf, Mylor, Aldgate Valley Drive, Stirling, Mount Lofty Lookout and then a descent back down Greenhill Road. After dropping Mark off in town, I received an email from Rowena at Bikesportz Imports advising I had won a day in the Astana Pro Team car next to Sporting Director Lars Michaelsen. Competition was one of those Facebook / Instagram competitions you see pop up around tour time. The competition was a jv between Bikesportz, Northwave and Astana . Astana are looking to imprpve their social media activation, and openining up their team to the public is one of their tactics. So, the next day I was down at the Tour Village at 9am to meet the team and ride in the team car for the day. First stop was North Adelaide for the start – I was given free rein to walk around the teams and start line. km 1 – stop the car to disable auto brake. The modern cars auto brake control system needs to be disabled as the drivers need to have full control of the car – the last think they want is to have the car automatically brake with a rider on their tail. Race radio provides a running radio commentary to all teams such as who’s in the breakaway, time gaps, call up for riders requesting attention / drinks etc. SD highlights the team sheets as the breakaway numbers are called out. 7km into race the SD wanted to get up and support the Astana rider in the breakaway group so pulled up next to the Team Sky car and asked if they wouldn’t mind providing backup because they use Shimano wheels. Yeah, sure. Moved up to the Commissionaire car and gesticulated approval to move forward – Yeah. Pulled through the vehicles and riders, horn tooting, moto cycliss moving over and pointing to where they wanted the car to go, riders making space. Whoops, the traffic director wasn’t prepared for us at the Mawson Lakes right turn and we drove straight through the intersection and into an open Salisbury Highway. At the start of Black Top Hill it was 40 deg C.
Lunch in the car – Pancetta, brie and tomato baguette. KOM Asana rider Zakarov 2nd, sat up to rejoin the pack. Lars urged him to stay with lead for next sprint. Unable to. Lars drives like he raced, fast, confident, trust in everyone else, predicting other movements with ease. Houghton loop, gusty haze, helicopters spooking horses in the paddock. Quiet reminder from Lars over radio to team to remember training rides. Just giving them a gentle reminder that they know these roads and there’s nothing to surprise them. Side of road water – advised by soigner that 6 bidons were picked up – means a few didnt grab any. Postleberfer crash in feeeding zon, it initially looked like Sagan. A few minutes later he came past the car with raw damage to the shoulder & buttocks. Lars mentioned the end of race party last year hosted by Paracombe Wines – showed me a video of the host Paul playing the piano – fond memories. Got us talking about wines. Of course I started talking about some of my favourite wines – Rockfords Basket Press. Cruise back to Main North Road. Astana riders not positioned correctly at last corner, Viviani takes the bunch sprint with a daring inside move. A great day and a fantastic experience. Thanks to all involved and thanks to Astana and Lars for making me feel very welcome. I promised Lars a bottle of one of South Australia’s finest wines, a Rockford Wines basket press, and whilst I had run out myself, I did find one of the apparently last available 2015 vintages at the Melbourne Street Wine shop and dropped it off at the Hilton Adelaide on Saturday night. I got an email from Lars a few days later – bottle arrived. That Barossa wine you gave me as a present – Rockford Shiraz 2015 – is truly fantastic. On Thursday I finished a 100 km ride with lunch at the Summertown Aristologist with the fine lads from the Ashton Cycling Club to watch Peter Sagan take the double at Uraidla. A fine afternoon. Friday was the cruisy day before the big ride, so drove down to Old Willunga Hill and erected the marquee in preparation for Sundays last stage, and spun my legs for 50km across Ridge road. Saturday was the TDU public challenge ride from Glenelg to Strathalbyn, with a ride back home. Overall a 231 km with 2,400m climbing. The ride from Glenelg to Strathalbyn was absolutely superb. The route was a relatively flat ride with only 1,500 m climbing over the 156 km distance. A slight headwind down to Goolwa via Yankalilla, and then a mostly tailwind on the ride into Strathalbyn. Tucking my nose into one of numerous trains allowed me to average a speed of 30.9 km/h. For me that is incredibly high. I was hoping for a 25 ish. I thought the week of riding would have me leg weary and struggling, but the legs felt surprisingly strong. At time I even had to grab the train and drag them over some if the climbs. Ha. There are quite a few things i like about a public ride like this, including the ability to talk to different people and hearing their views on a cycling life. What stands out to me though is the ability to jump into a train that I would not normally be able to get onto, push myself a little harder and reap the rewards with the speed and enjoyment. However that does mean the risks rise with riders not familiar with each other, or not used to riding in trains at high speed – the chances of a touch of wheels is quite high. Unfortunately for the rider in front of me as we were coming into the last climb before the cresting into Victa, a momentary lapse in concentration resulted in a touch wheels with the guy in front at approx 50kph. I saw his bike cartwheel and took evasive action into the bush on the left, fortunately having enough room to safely stop. Going back to see how he was I was surprised to see the fallen rider get back up and walk over to his bike t o pick it up. Amazingly the only damage was a small crack to the back of his POC helmet and a relatively minor graze on the back of his right shoulder. Even his bike was relatively unscathed. After checking him put and talking to him i recommended he call it a day because you never know with concussion, but he was quite adamant he was ok, a little shaken but ok. So I left him with his mate who had also stopped and resumed my ride, unfortunately not with the train. 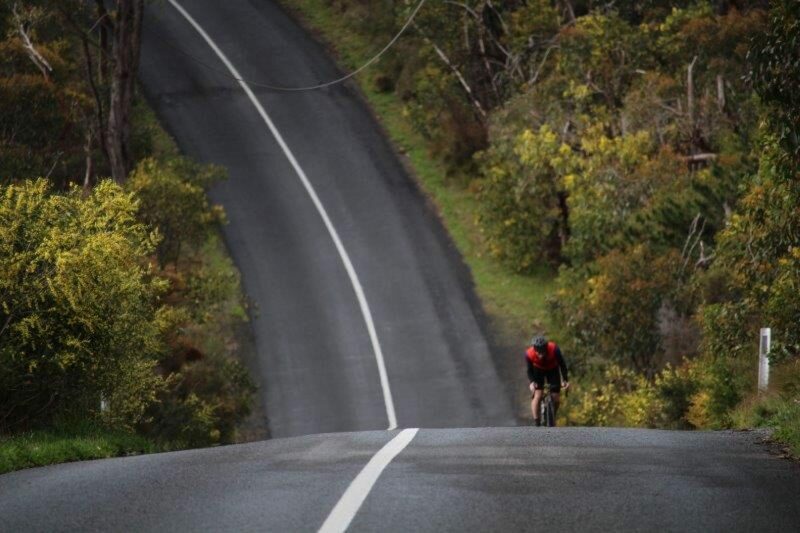 Sunday was another day on top of the Old Queen – Old Willunga Hill. Another great day with good friends and a buzzing hilltop. Kimmie from Schwalbe/Bike Box – along with Lisa have been setting up next to Wednesday Legs for the last 4 years. And then, just like that, the green light vehicle came through, Darryl Impey had won back to back tours, and chaos hit the hill. Over the week I caught up with some friends I hadn’t seen for quite some time, made new friends, and caught up with a number of people I had only communicated with via email. I even received media accreditation for this years tour, so was able to get to spots I hadn’t got to previously. All up a brilliant week. Special thanks to the great people at Cancer Council for there support and guidance over the last 6 months. I’m keenly looking forward to seeing what the final donations come in at. Thanks to the #RFAR coach Pat Jonker for his support and cycling insights over the last 6 months. Thanks to all the people who supported me through their donations to the Cancer Council. Donations have come in from far and wide, including family, close friends, cycling buddies, friends I haven’t seen for a long time, clients, my Wednesday Legs blog readers, a few anonymous donations and via Cancer Council donation boxes at a few establishments including Red Berry Espresso Coffee Roastery. I am humbled by your generosity and support. Chapeau to you all and to those who have donated to other RFAR riders. The following, in no particular order are those who supported my ride and the Cancer Council. Well done Ian for helping with this great cause – just try not to show up the professionals and win the Tour! Don’t know you from a bar of soap, except that I get so much pleasure from reading your blogs. You’re an inspiration. Thanks for being a great ambassador for the sport. Bravo, great cause & you deserve to be up front leading riders out as your’e one of Adelaide’s cycling ambassadors!! Good onya IP. Enjoy the day !! Good cause and hopefully you can have some fun too! Enjoy the ride Ian, doing something you love for a great cause. Good on you Ian! Love and respect to your effort and the cause!